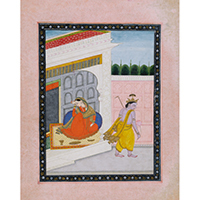 Krannert Art Museum will show small, richly colored paintings commissioned by Indian royals from its collection in the exhibition “From Hand to Hand: Painting and the Animation of History in Northern India,” opening Feb. 28. 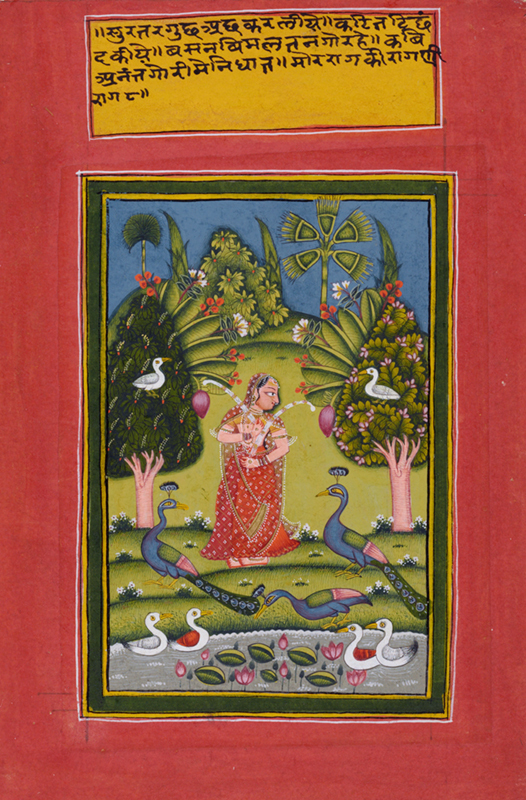 CHAMPAIGN, Ill. — Small, richly colored paintings created in northern India from the late 1500s to the early 1800s animate vivid stories from the great Hindu epics, passionate verses of devotional and love poetry, and noble portraits of Rajput royals. Selections from Krannert Art Museum’s collection of such paintings will be on view in the exhibition “From Hand to Hand: Painting and the Animation of History in Northern India,” opening Feb. 28 with a public reception at 6 p.m.
Small in scale and featuring rich jewel-toned colors made from ground semiprecious stones and other organic materials, paintings produced for the Rajput courts were not meant to be framed on a wall or looked at from a distance. Instead, they were meant to be held, passed from person to person and shared for intimate viewing with courtiers or given as gifts. 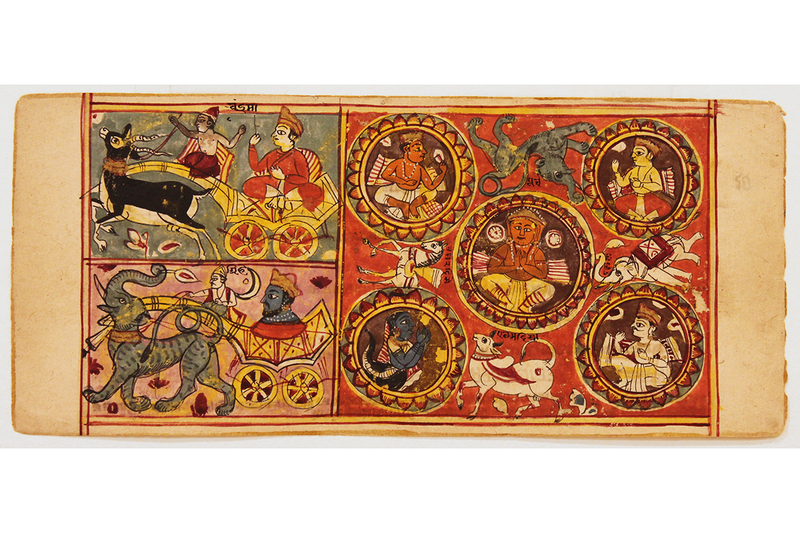 Many of the paintings were commissioned by royals and created in workshops of the Rajput courts – semi-independent Hindu states in northern India that had come under the control of the Mughal empire. 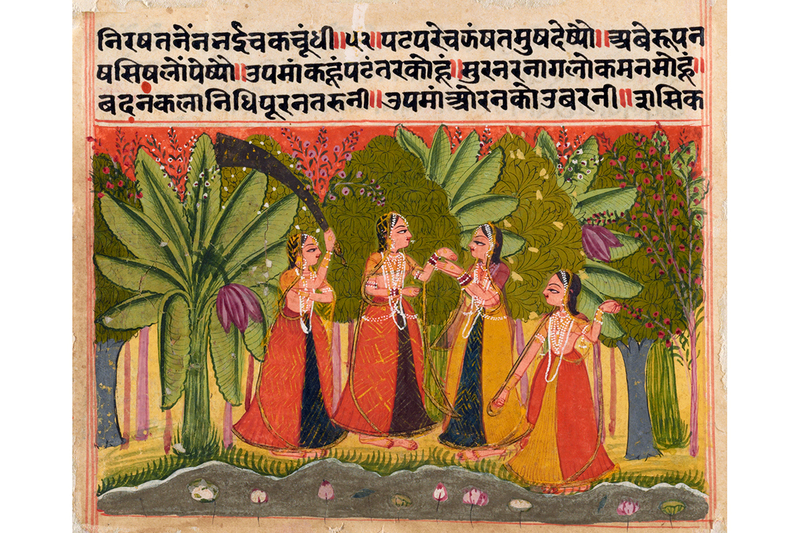 “During this time period in India, paintings became an important medium of visual culture, complementing music and poetry,” said Allyson Purpura, the curator of global African art at KAM. 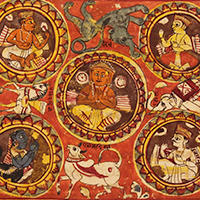 “Typically referred to as ‘miniatures,’ these paintings were meant to be held in the hand and passed around at what some scholars have called a picture session. Personal contact was part of the process of sharing them. The paintings on view show dramatic scenes designed to evoke certain moods in the viewer. Some were inspired by the bhakti devotional movement, in which a devotee’s loving adoration of Krishna became a metaphor for union with a transcendent god, Purpura said. 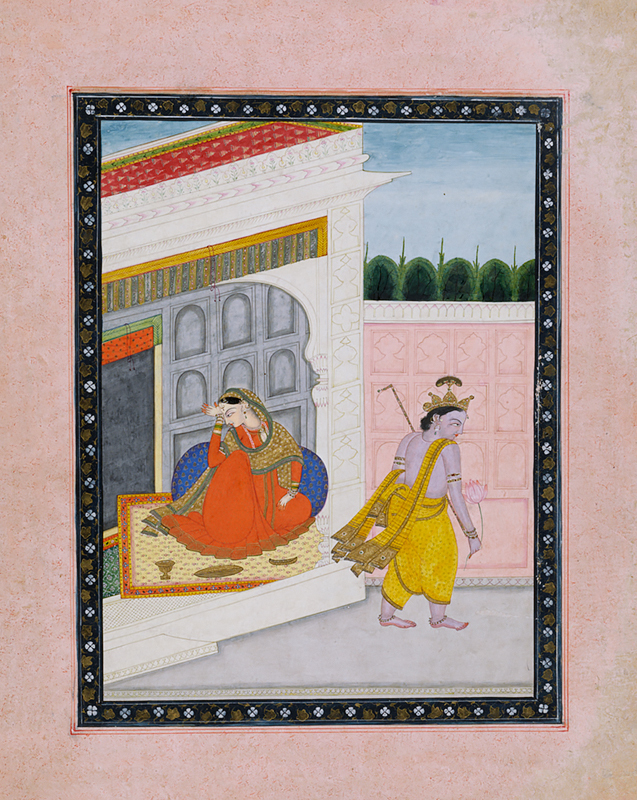 “But while the mischievous Krishna is the ultimate figure in the dramas of both divine and earthly love, it is women – the heroines, their devoted attendants and Radha herself, Krishna’s supreme love – and their romantic predicaments that take center stage in many of these paintings,” she said. “Many of the works were mobile, as were artists themselves. Some moved between workshops connected to the courts, developing their own rich, hybrid idioms inspired by local Indian and Mughal styles,” Purpura said. Not all of the paintings in KAM’s collection were princely commissions. Some of the paintings may have been used as aids for traveling storytellers. Others were meant to be carried by pilgrims on journeys to temples in eastern India. Many of the works are illustrations from personal albums or religious manuscripts whose individual pages have long been dispersed. 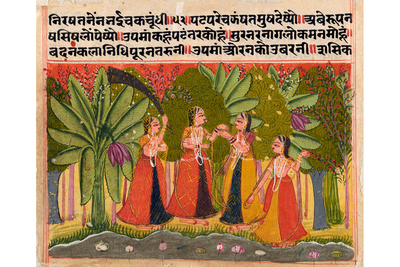 The Indian paintings in KAM’s collection primarily came from donations by two well-known collectors, Alvin O. Bellak and George P. Bickford, as well as some paintings donated by Allen Weller, former College of Fine and Applied Arts dean and the first director of the museum, and Rachel Weller. 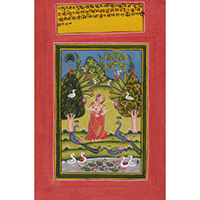 The exhibition also will include a Nepali manuscript, the “Svasthani Vrata Katha,” on loan from professor of religion Jessica Vantine Birkenholtz. Events at the museum related to the exhibition include a performance by members of the student organization Society for the Promotion of Indian Classical Music and Culture Amongst Youth. Consulting with Purpura, the students created musical and dance compositions that relate to the paintings. They will perform the original compositions at 6:30 p.m. March 7. The public is invited to two gallery conversations. The first, “Darshan and Design,” featuring Yutong Shi and Samit Sinha, curatorial interns who worked on the exhibition, will be at 4 p.m. March 28. A second gallery conversation is scheduled at 5:30 p.m. April 11. Purpura will moderate a discussion that will include Birkenholtz; Rini Bhattacharya Mehta, a professor of comparative and world literature; and Dede Fairchild Ruggles, a professor and the Debra L. Mitchell chair in landscape architecture. Editor’s notes: The Society for the Promotion of Indian Classical Music and Culture Amongst Youth dance performance is co-sponsored by the India Studies Fund and administered by the Center for South Asian and Middle Eastern Studies at Illinois. For more information about the exhibition, contact Julia Nucci Kelly at jkell@illinois.edu.